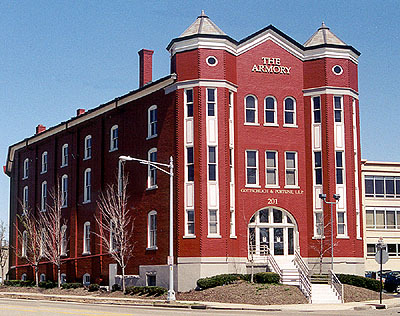 The Armory Building, constructed in 1893 by John Schenk to house the drilling exercises of the Dayton Ohio National Guard, has held a prominent place in Dayton's history. The project to renovate the tired historic structure involved the revitalization of the exterior with a new color scheme that closely resembles the original brick and trim colors. The interior design of the offices was an effort to highlight the open warehouse floor plan and respectfully insert eight offices into the space. The old and new construction complement each other through contrasting colors, materials, and textures.